Lenox SILHOUETTE GOLD 8-3/4” x 3-1/8” Water Goblet 315568 11 Available Pristine! 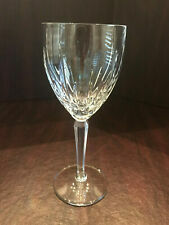 LENOX CRYSTAL "SOLITAIRE PLATINUM" PATTERN WINE GLASS 8" EXCELLENT!! Each glass is marked Lenox on bottom. This pattern is the exact pattern as Fostoria Navarre. I have matching claret wine glasses and fluted champagne glasses. AMAZING etched crystal with intricate flowers and branches. Crystal Cordials - Assorted Colors. For sale is a Lenox crystal wine glass in the Clarity pattern. It is acid etched Lenox. Base of each glass is marked: Lenox USA. All in great condition. I do not see signs of use. They are not cloudy, it's only sun glare and I would say 98% of the platinum trim is present with little to no wear. 7" tall by 3 1/2" wide across the top rim, each holds approx. 10 ounces. We do Not lie, steal or cheat. STILL HAVE STICKER ON BOTTOM THAT SAYS MADE IN CHINA, DON'T KNOW IF THEY HAVE EVER BEEN USED, FROM ESTATE. SEE PHOTOS. Set Of 4 Lenox Crystal Moonspun Platinum Trim Champagne / Sherbet Goblets Mint no chips, scratches or platinum loss Measures 5” See last picture for pattern detail See my other listings of this pattern and I do combine shipping. Lenox Crystal Set of 3 Double Old Fashion Glasses CHARLESTON Pattern Mint 4"
Lenox Crystal Set of 3 Double old fashioned Glasses CHARLESTON Pattern Mint 4". Condition is Used. Shipped with USPS Priority Mail. No wear, chips, cracks or damage of any kind. Balloon Wine Goblet Glass Lenox Crystal Holiday Gems Ruby Red 3 Available. Shipped with USPS Priority Mail. 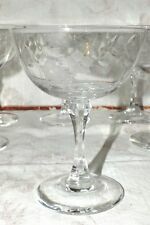 NEW UNUSED One Lenox 'Maywood' Crystal Wine Glass With Platinum Rim 5-1/2" Exc. I have three total in excellent condition. If interested, I will group them for an agreed upon price. (Set of 6) Lenox Crystal Encore Gold WINE GLASSES. Excellent Cond! (Set of 6) Lenox Crystal Encore Gold WINE GLASSES. China Cabinet. Very Well Cared For. Each Piece Has The Lenox Etching. Excellent Condition! Very Clean And Clear. 7 7/8" Tall. Gold Trim looks good. Pre-owned, good condition. In very good condition with hand wash label attached. Tiny scratch from storage, can be seen only in bright light. I am a dedicated picker! Width: 3 3/8 in. LENOX Crystal 4" Vase. Czech Republic. Perfect unused condition. This pattern was produced by Lenox from 1979 through 1994 but is now discontinued. LENOX CRYSTAL DOUBLE OLD FASHIONED GLASS "DEBUT" RETIRED 4"
For sale here is aLENOX CRYSTAL DOUBLE OLD FASHIONED GLASS in the "DEBUT" pattern (RETIRED). Lenox CLASSIC FEDERAL GOLD Wine Glasses, Set Of 5. Condition is Used. Shipped with USPS Priority Mail. Piece: Highball Glass. Manufacturer: Lenox. Pattern: DEBUT. China - Dinnerware Crystal & Glassware Silver & Flatware Collectibles. Condition: 3rd Quality - These pieces will have noticeable imperfections and will show visible wear such as scratches, flaws, stains, trim wear, and may also have been designated by the manufacturer as seconds. FLATWARE 1847 Rogers Bros. Platinum trim. STEMWARE & GLASSWARE. CHINA & DINNERWARE. The box says No. 30926 Coaster/Ash Trays. The box also says Made in Italy exclusively for Taunton Silversmiths, Ltd. Taunton, MA. Sheridan is a division of Lenox. The box states they can either be used for coaster or ashtrays. 4 Lenox Ruby Holiday Gems Ball Stem Water Goblets - Nice! They look like they were never used with Lenox stickers still on them. 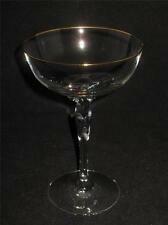 Lenox Citation gold wine glass. Aria shape, optic, gold trim. Gorgeous Lenox Cat ~ sitting pretty. Lenox Wine Glasses Set of 4 Tuscany Harvest Collect American by Design NIB. Shipped with USPS Priority Mail. Beautiful Fostoria crystal ice tea glasses in the Bouquet pattern. Glasses are bright. and on my computer. 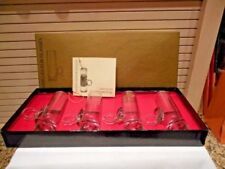 (4) Lenox "Firelight" Panel Cut Water Goblets, 8 5/8"
Excellent New Condition in Box. 4 Lenox Crystal Madison champagne flutes. Beautiful set of 2 crystal ice tea glasses by Lenox. This gorgeous set features gray cut/etched decor near the top with gold trimming. The stem has a multisided pillar design with raised dots near the top. Lenox Heather Champagne Flutes. 7 Oz Glasses. Clearance:Lenox stemware glasses. Included in this lot are 7 12-ounce glasses and 3 8-ounce glasses in a rich brown color. Harlequin pattern. Candle holders. Lead Crystal. New in box. On the bottom where the stem ends. 12 Once can of V-8 not included. 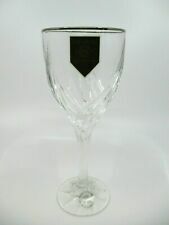 5 LENOX crystal MADISON Platinum Trim pattern Wine Goblet Glass 7-1/2”. Condition is gently used condition. Only used a few times over years, spent most of time in cabinet. Smoke free! Don't hesitate to ask! Answered promptly. We are located in California. 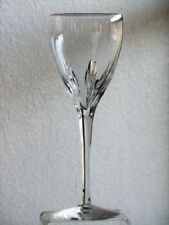 LENOX Crystal Vase CHARLESTON PATTERN Acid Etched Signed 9" MINT. Condition is Used. It is Lenox, acid etched signature on bottom, Charleston pattern. Mint condition, 9" tall, 4 1/2" wide. Any questions, please email. Thanks for looking. I have other pieces of this pattern listed this week, please have look. A classic in Lenox fine crystal; Sip champagne or sparkling beverage in style with the Firelight flute. Crafted of Lenox fine crystal, the flute features exquisite cuts. If your are still unsure about details just ask. You don't have to file Not As Described. I will NOT distort the price. (48 MAINLAND STATES). and view the pictures provided.